Manchester Black where have you been all my life? Supergirl gets its own version of Spike from Buffy as tonight’s episode introduces a trench-coat wearing, absurdly named British bad boy. 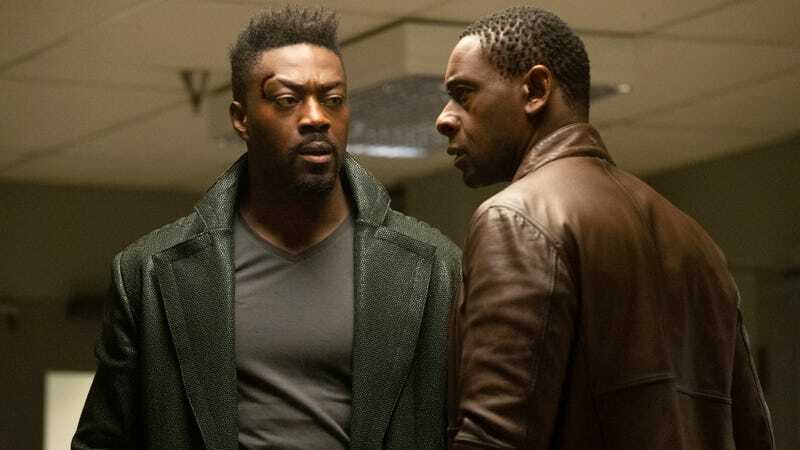 Charismatic David Ajala is a welcome addition to the Supergirl cast, especially in an episode that puts its focus on the show’s deep bench of supporting players. “Ahimsa” was clearly constructed to allow Melissa Benoist to film as little as possible—either because she was finishing up her run in Broadway’s Beautiful or, more likely, because she was filming the big Arrowverse crossover. As is often the case when an episode is written around a real-world logistical concern, there’s definitely a slight awkwardness about “Ahimsa.” But thankfully Supergirl’s talented ensemble is more than capable of picking up the slack. Chyler Leigh and David Harewood carry the bulk of the weight this week as Alex and J’onn struggle with the new paths they’ve chosen for themselves. Alex is overwhelmed with the responsibility of leading the DEO during a time of social upheaval and intense political scrutiny. J’onn, meanwhile, is struggling with his decision to pursue a path of non-violence to honor his father. Though they’re initially hesitant to open up to each other about their struggles, once they do, they find the encouragement they need to carry on. Their conference room scene is a great use of the warm, familial dynamic that Alex and J’onn (not to mention Leigh and Harewood) have developed over the years. Whereas last season it felt like the show would awkwardly pause its ongoing storytelling to give Alex and J’onn tangential plotlines, their emotional beats in this episode feed directly into the season’s overall arc. Speaking of which, let’s talk about how the Supergirl writers room is structuring this season, because that’s the thing I’m most impressed with right now. These first four episodes have told a mini-arc that comes to an end tonight as Mercy and Otis are taken down (killed?) after setting mind-controlled aliens loose on National City. Yet “Ahimsa” also serves as an introduction to the next chapter of Supergirl’s storytelling too. With Mercy and Otis out of commission, Agent Liberty uses a psychic parasite to deputize Jensen (Wrath Of Khan-style) as his next agent of chaos. Meanwhile, Manchester Black is another new wildcard for the season. As a friend of J’onn, he’s essentially an ally to our heroes. Yet his desire to violently avenge Fiona’s death will likely put him at odds with them as well. With all those moving parts at play, we seem to be in for a season that’s broken into interconnected multi-episode arcs that play out under the larger umbrella of the ongoing season-long storylines. That’s a really smart way to handle the structure of a network TV show as it ensures that Supergirl is more episodic than the “it’s one long movie!” approach of prestige TV, but also more serialized than the “monster-of-the week” approach that can sometimes feel monotonous. Plotwise, “Ahimsa” is serviceable if not exactly exhilarating. Of the two big action scenes, the police station fight is more compelling, although both utilize the cinematic style that Supergirl is great at deploying during its hand-to-hand combat sequences. For the most part, the plot just hinges on our heroes conveniently figuring things out at the right time. Yet leave it to Supergirl’s cast to make even that thinly written material work. 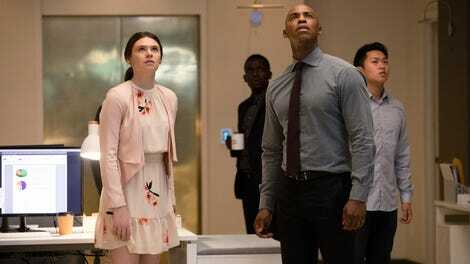 That Lena and Brainy magically figure out a way to use nanites to remove the Kryptonite from the atmosphere is pretty silly (the whole Kryptonite poisoning happened way too quickly and was resolved way to easily), yet the Lena/Brainy scene is maybe my favorite scene in the entire episode because Katie McGrath and Jesse Rath are so, so good, and the writers clearly have so much fun writing those characters. It’s hard to say which moment I enjoyed more—Brainy crying (“These are tears of logic”) or Lena barking at him that the only way to be a functioning person is to tightly compartmentalize all of your emotions. Both lines are absolutely hilarious and absolutely in keeping with the essence of those characters. Even the return of Guardian couldn’t ruin this episode for me, although I’ll never forget the brief joy I felt at thinking the character had been retired for good. Thankfully, both he and James are kept to a minimum in this episode, and I guess if Supergirl is deadset on Guardian being a part of the show, having James deal with the fallout of inadvertently becoming an alt-right (er, “Earth First”) hero could potentially be interesting. Hopefully we’ll also get a bunch of scenes of Nia and Lena chastising James about how dumb Guardian is too. What’s most impressive about “Ahimsa” is the fact that it succeeds despite its clear limitations. Chyler Leigh spends half this episode acting alongside an extra wearing a Daft Punk helmet and yet she absolutely sells every single moment of her emotional arc with Kara. This is probably the weakest episode of the season so far, and it’s still a hugely enjoyable one to watch. That speaks to the groove Supergirl has found for itself this season. Even with an imperfect episode like this one, I still feel like I’m in good hands and that’s a nice feeling to have. Now that Kara is done being Knockoff Iron Man, Supergirl can hopefully get back to being the absolute best version of itself. But first, Kara’s got a whole lot of pie to eat. I assumed Fiona was already dead so it was weird for this episode to bring her back only to have her die again. The end of this episode also introduces April Parker Jones as Colonel Lauren Haley, who has been ordered by President Baker to oversee the DEO. I absolutely love the visual of Manchester Black dodging punches and using his enemies’ momentum against them. I hope that’s a fighting style the show keeps utilizing even now that Manchester has heavily armed himself. She may not be in this episode a lot, but that final shot of Melissa Benoist as Soviet Supergirl was spine-tinglingly good. I screamed when the CatCo Balcony of Deep Thoughts made its glorious, long-awaited return.